If you've been Blendering for a while you have probably run in to the problem that you're working on this cool animation, but what you'd really want is that one model you created three weeks ago. You have the model, spent an entire weekend on making it just right, and now you want to use it again without having to model it all over again. Here's a little 'how to' on appending from other .blend files. To use the append feature you need, of course, at least two .blend files: one to append to and one to append from . Download my demo file below, start up Blender and load the file with . 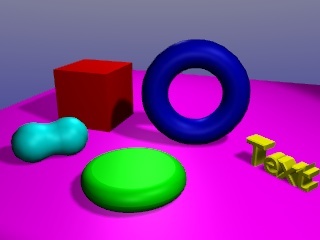 You'll see a bunch of objects of different types; mesh, curve, surface, text and metaball, all with different materials. This is the file we'll be appending from. Now press and confirm the popup to reset Blender and delete the default plane. We'll use this setup to append to. Ok! Let's start appending models. Hit and browse to the demo file. You'll see all the .blend files are shown in white. If you click the .blend file you'll see you can browse the file as if it was a directory. This way you can see the entire data structure! If you want to import models you have to look under 'Object'. Find the donut (it's called SurfDonut) and middle click it...hey presto! 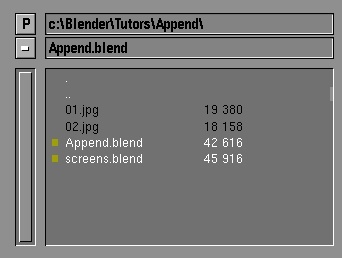 In complex .blend files with many objects it is very imported to give your objects useful names! It's impossible to find an object when all your models are named Plane.001, Plane.002, ..., Plane.321 . You can name an object by clicking on the 'Ob:' button in the header of the EditButtons . 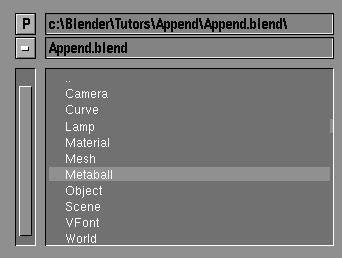 It is important to know that Blender remembers everything about an object when it is imported including its location and on which layer it is. If you examined the demo file close enough, you'd have noticed the CurveCircle was on layer two! So press or click the button for layer 2 in the 3d window header to activate the layer. As you can see Blender did import the CurveCircle! If you want to import objects with a complex parenting hierarchy you should import them all in one go. The child-parent relation will be lost if you import them one at a time! In this way you can import any object from another file, but you can also import materials and textures this way! As a final exercise I'll show how to import a material. Add a new object (I chose an Icosphere) and move it into clear view. I want the Icosphere to have the yellow color of the text in the demo file. Press and click the '..' to go one level beck in the data structure. 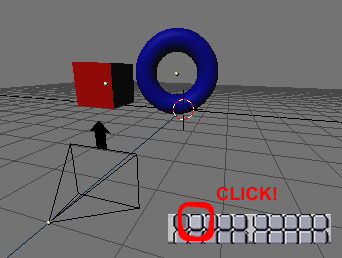 Now click material and click yellow with (now aren't you happy I named those materials?). 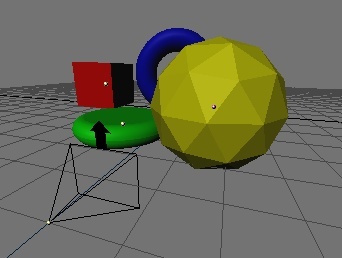 Nothing seems to have changed, but press to go to the MaterialButtons and with the sphere still selected click the '-' button and select the yellow material we just imported (it should have a 0 in front of it, because it's not being used by any object yet). The sphere is yellow! Yay! And that's it. Now you know how to import any object or material from your old projects!